When we were at Chris’ party, somebody told us that this happened. Sort of. Chris was there while he wanted to buy a gift for him, but I believe he just decided to come back later to try again. 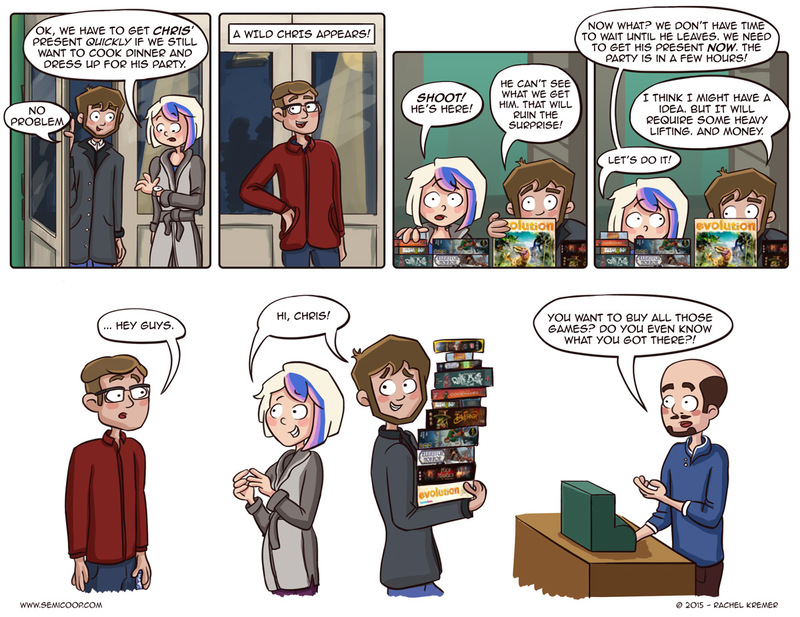 It did make us realize that it can be tricky to buy a gift for somebody who hangs out often at the only comic/board game store in town and is totally into board games. Of course you could just order something online, but we like to support our FLGS (Friendly Local Gaming Store). Speaking of a pile of games… Last thursday was Heinze’s birthday and that means our board game collection only got bigger! We can now add Evolution, Ticket To Ride: United Kingdom and Eldritch Horror: Mountains of Madness to the list of our collection! We’re now at a point that we might have too many games? But is there such a thing, really? It’s just that we now own so many games that it’s really hard to make a choice which game we should play. Or we might have to decide that we should to give away some games that we never play (anymore). All in time, for now we’ve just decided not to buy even more games the coming months. How do you choose what game to play when you have (too) many brilliant games in your collection? there is a game to help chose witch game to play. that would only work for people with to manny games and if your ofthen stuck about what you want to play. other wise say you have 100 games. trow 2 D-10 dice. pick the game where it lands on (alphabeticly.) random game picking can lead to fun/weard moments. The BoardGameGeek app is very useful for browsing your own collection and picking the right game for the time you have and the number of players. It’s also very useful to keep track of your wishlist when your birthday or a gift-giving-holiday is coming up!